My first European Cup final commentary for the BBC was the hotly-anticipated match between Liverpool and Italian side Juventus at Heysel stadium in 1985. It was 29 May and I was alongside commentator Peter Jones and former Liverpool captain Emlyn Hughes and 25 years later I have no memory of describing any of the football played that night. It was a complete irrelevance. I still find it unreal to think that the game went ahead after scenes that will live with me for the rest of my life. Fathers and sons died in front of me - 39 in all - and more than 600 others were injured. I had prepared for a football commentary and found myself in a war zone. Peter described the tragedy as it unfolded as only he could. The BBC was fortunate on this occasion to have had one of the great radio broadcasters of the 20th Century in the stadium. At all times Peter was in complete control of his emotions and his choice of words and I will never forget the professional standards he set that night. When it was time for us to do our match commentary he grabbed my arm and reminded me that this was still a European Cup final, but he knew that the game would pass both of us by. For the record Juventus lifted the trophy after Michel Platini scored from the penalty spot to win the tie 1-0 . 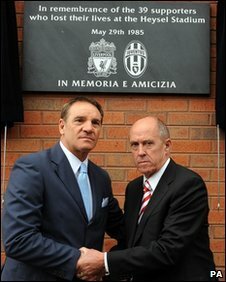 Equally surreal was to fly back to Liverpool the next day with the team and go straight to a news conference where Kenny Dalglish was unveiled as the new manager in succession to Joe Fagan who had announced his retirement before the Heysel final. Kenny and I went through the motions of doing an interview - sadly this would not be the only time this dignified sportsman would find himself having to come to terms with grief and tragedy at Anfield. Four years later, 96 Liverpool fans died in Britain's worst sporting disaster, Hillsborough. 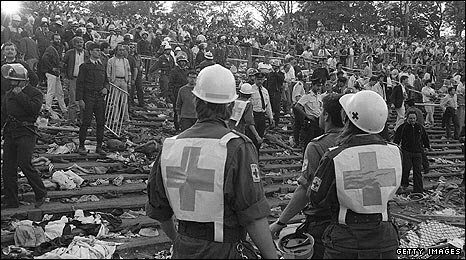 As a footnote to all of this and again equally bizarre, within a week of the Brussels disaster I found myself in Mexico City commentating on another fixture that, with hindsight, should never have taken place as a mark of respect for those who lost their lives at Heysel. It was an international friendly between England and Italy. I have been fortunate to cover more than 300 England matches and this was the one that mattered least of all.